McDonalds is known as a world’s largest hamburger fast food restaurant company in the United States of America is now hiring staff for United Arab Emirates outlets. About the Company : All McDonald’s restaurants in the UAE are 100% locally owned and operated. All business decisions are locally made and revenues are reinvested in the local economy. Emirates Fast Food Co., the owner and operator of McDonald’s restaurants in the UAE is proud to serve the UAE some of its favorite food since 1994. Along the way, they’ve managed to grow with a region we have become part of. They strive to serve safe, high quality products to all their customers across their restaurants in the UAE. 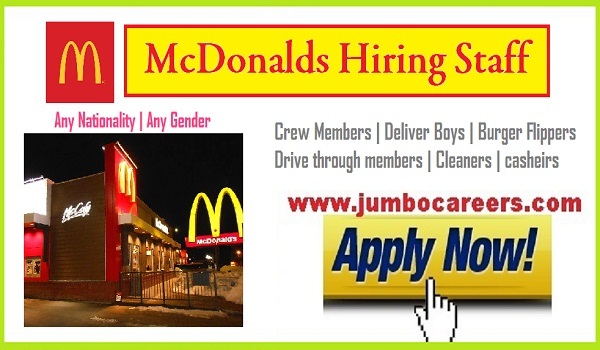 How to apply for latest MCDonalds jobs and careers UAE 2018?